The Winnemucca Convention and Visitors Authority contacted TSK in the spring of 2017 to develop layouts and design for a new equestrian arena. The proposed facility needed to be efficient due to a limited budget, constructed quickly and flexible for multiple events—primarily equestrian but also concerts and Western lifestyle festivals. TSK and the construction manager, Michael Clay Corporation, provided recommendations for a pre-engineered metal building with a custom fabric roof enclosure. TSK also coordinated with the local building official to review the translucent fabrics, coordinate life safety requirements and fire ratings to ensure the safety of all occupants—two and four-legged. The project included egress capacity for music festivals, 15 overhead doors, fire sprinklers, sound system, below grade livestock hose bibs and two-level lighting. In response to the high desert climate, the facility has snow stops, gutters and down spouts, subgrade drainage system, evaporative cooling and suspended radiant heaters. 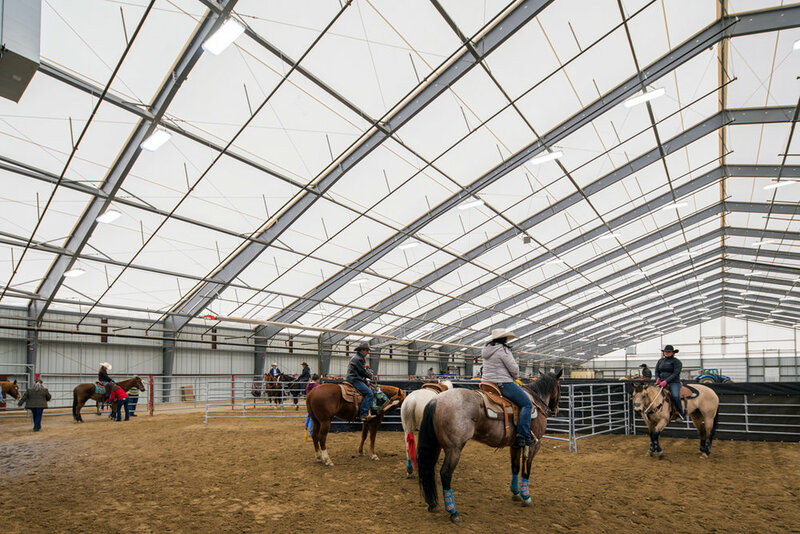 The Winnemucca Equestrian Arena will provide 12-month access to rodeos and festivals and will allow the rural and vibrant economy of Winnemucca to attract new events and visitors in an expanded venue, contributing to the economic growth of Winnemucca and Humboldt County. Construction was completed in 18 weeks. Legacy Building Solutions was the pre-engineered building manufacturer and provided engineering layouts and calculations for the primary structure.